After seven straight games away from home, the Quinnipiac Bobcats women’s basketball team (4-3, 0-0 Metro Atlantic Athletic Conference) finally comes home to host the Central Michigan Chippewas (6-1, 0-0 Mid-America Conference) in a battle between two top-tier mid-major schools. Thornton, a 5’9” senior guard, has as high a motor as anyone on the floor. 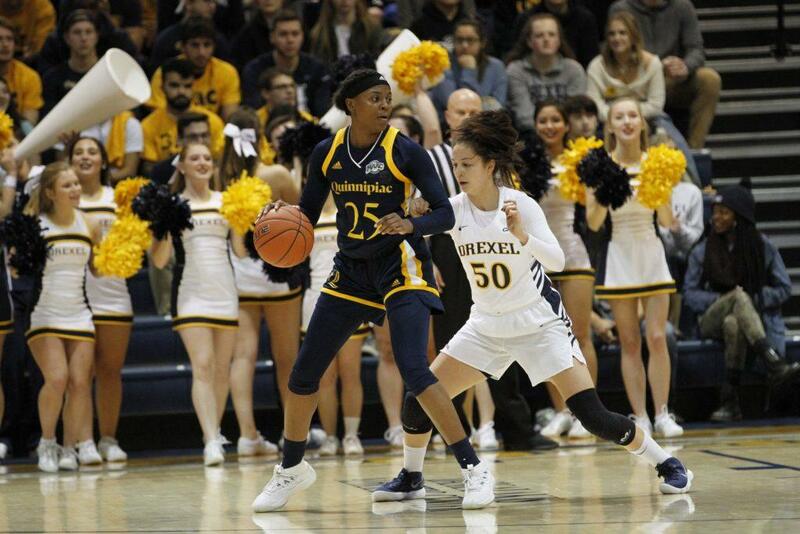 She’s a speedy guard and a pesky defender, and against a team that shoots at one of the highest clips in the nation, she’ll be a leading contributor in Quinnipiac’s effort to contest the Chippewas’ shots. Offensively, she’s a secondary member of a Gold Rush’s first unit that contains Jen Fay, Aryn McClure, and Paula Strautmane, but launches threes at one of the highest paces on the team and has the ability to get hot from the shoulder if she gets left open. Hudson has, far and wide, been the best player for the Chippewas thus far. Standing only 5’6”, the senior guard averages 23 points and 6 assists on 46.2 percent shooting. Most of her production comes from behind the arc, as 62 percent of her shot attempts have come from 3-point range. She can make those shots as routinely as anyone in the conference – her 43.8 percent shooting percentage from 3 is 14 points higher than any Bobcat who’s shot over 20 3-pointers. It’s no surprise that with the outstanding shooting of Hudson, Central Michigan as a whole is a sharp-shooting team from anywhere on the floor – as a unit, they shoot 43.4 from behind the arc. For a Quinnipiac team that simply won’t be able to match those numbers in a shootout, they need to limit the Chippewas’ looks from outside and make sure they aren’t launching 23 threes, which is what Central Michigan averages on a per game basis. Moving the rock, working the ball in and out of the post, and chewing up anywhere between 15 and 20 seconds on the shot clock will often leave at least one person open on the perimeter for a shot. Central Michigan relies on the three ball, and if they can stay patient and force a defender to come off their assignment, the Chippewas may be able to use their greatest strength to their own advantage. Be sure to tune in to QBSN’s broadcast of all the action when the Quinnipiac Bobcats host the Central Michigan Chippewas on Sunday at 2 p.m. Will Fowler and Bryan Schwartz will be on the call. For live updates, follow @QBSN, @WillFowler5, or @BryanSchwartz15.